We are so busy working, doing and achieving. Have you made time to connect with your loved ones? Are you creating meaningful connections with your clients or colleagues? I love dresses!! It is one of the easiest outfits to choose when you are going out. Dresses can give you a feel from super casual to beach style to evening style. They are my go-to piece when I do not want to spend much time thinking about what to wear. A few weeks ago I went to Bali and when I was packing I realised I didn't have many dresses that were summery but still dressy to wear by the pool. Luckily I found this colourful one at Pasarela fashion. I have got so much wear out of it already! I love the colours and soft fabric. I like buying pieces that are versatile and easy to dress up and down. I have worn this dress with flat shoes and with heels in different colours - the possibilities are endless as it has many colours. I can also dress this up by adding a structured jacket for a more professional look or spice it up with glam jewellery for a night out with the girls. Like always, your personality is important, I love colour and bold looks. 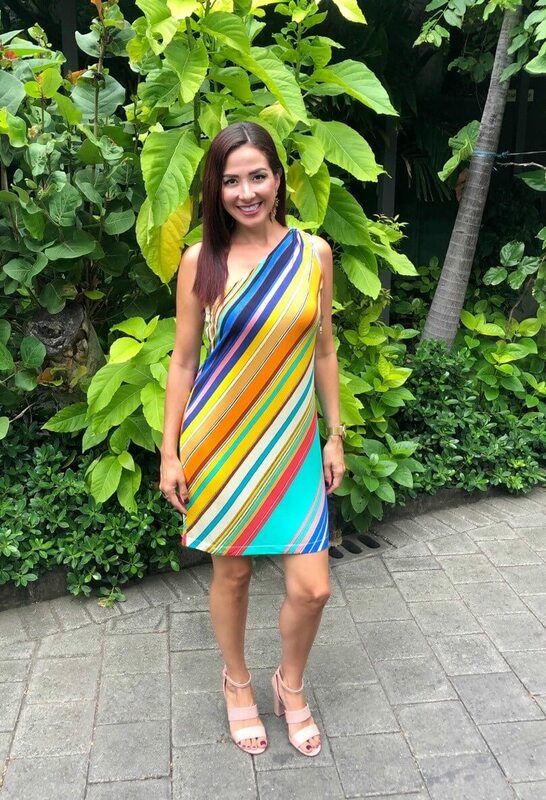 My lifestyle requires outfits that go from the beach to the boardroom so I make sure I have clothes that can work for lots of different settings. This means I can always find something to wear that I love in my wardrobe that fits with my personal brand. My passion is helping women use their personal brand to convey more authority and increase their influence in business and in life. Which is why for the first time I am running a full day workshop in Perth. If you are a professional woman in Perth you will want to make sure you check out my new WORKSHOP!!! There are only 2 spots left for this workshop in Perth. The Presence Formula. Do not miss this opportunity to develop your personal brand and presence to take your career to the next level.